The 30th season of the Texas Parks and Wildlife Department (TPWD) Toyota ShareLunker program began October 1. ShareLunker entries that genetic testing shows are pure Florida largemouth bass are used in a selective breeding program at the Texas Freshwater Fisheries Center (TFFC) in Athens. Offspring from ShareLunkers that spawn are stocked into each waterbody that produces an entry during the season. Some offspring may be used for research, while others may be retained by the hatchery system for use as future brooders. Anglers entering fish into the Toyota ShareLunker program receive a free replica of their fish, a certificate and ShareLunker clothing and are recognized at a banquet at the Texas Freshwater Fisheries Center in Athens. The person who catches the season’s largest entry will be named Angler of the Year and will receive a prize package from G. Loomis of a top-of-the-line rod, Shimano reel, PowerPro line and G. Loomis hat. If the Angler of the Year is a Texas resident, that person will also receive a lifetime Texas fishing license. ShareLunker catches can be reported 24 hours a day, seven days a week during the season, by calling (903) 681-0550. If poor cell phone service prevents use of the voice number, anglers can leave a phone number (including area code) at (888) 784-0600. That number is also monitored 24/7 during the season. Program the ShareLunker numbers into your phone. Most anglers who catch ShareLunkers are unprepared to catch and care for large fish. 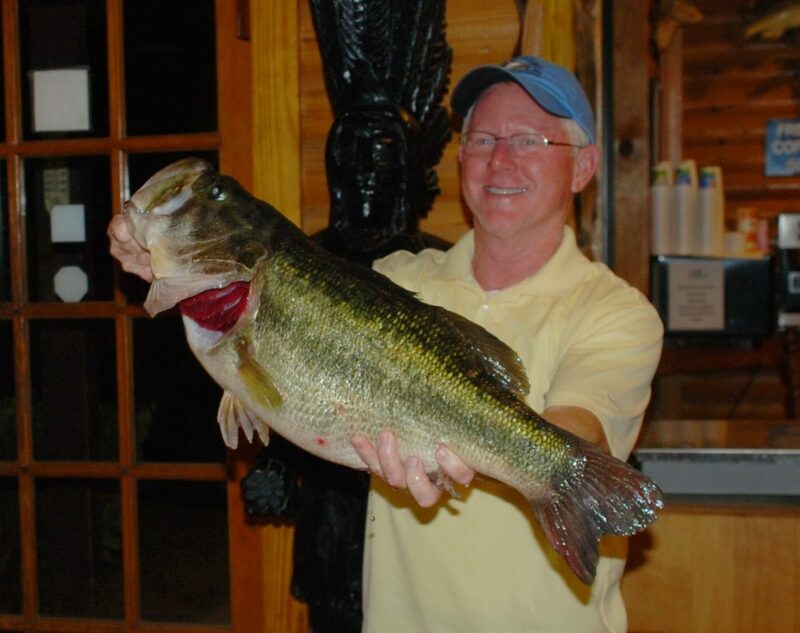 Yet catching a 13-pound bass is possible almost anywhere you fish in Texas. Taking a few simple steps can help ensure the survival of ShareLunkers. Carry a landing net, preferably a rubber one or a net with unknotted mesh, to avoid damaging the fish’s slime coat. Always handle big fish with two wet hands, one gripping the lower jaw and the other supporting the tail. Fill your livewell before you begin fishing. If possible take the fish to a bait shop or marina with a minnow tank for holding until pickup. Locate a place near where you will be fishing that has a certified scale and will weigh fish, such as a feed store, grocery store or bait shop. Official ShareLunker weigh and holding stations equipped with certified scales have been established at a number of reservoirs; a list is at http://www.tpwd.texas.gov/spdest/visitorcenters/tffc/sharelunker/holding/. For complete information and rules of the ShareLunker program, tips on caring for big bass and a recap of last year’s season, see www.tpwd.texas.gov/sharelunker/. The site also includes a searchable database of all fish entered into the program along with pictures where available. Information on current catches, including short videos of interviews with anglers when available, will be posted onwww.facebook.com/sharelunkerprogram. “Like” this page and you can receive notification and photos of catches as soon as they become available.